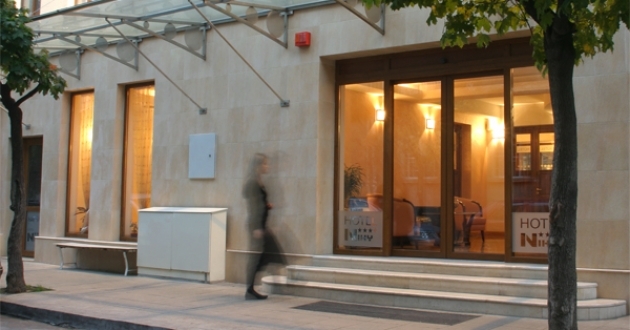 Location: The hotel is situated in the centre of Sofia city, near Vitosha boulevard and the business, administrative, commercial and cultural attractions. Accommodation: There are 17 suites, 3 single and 2 double rooms. Each suite contains a living room area, furnished with table, sofa, an armchair and a cable T.V. (with 60 channels); a work area equipped with a direct dial telephone line and a free to access Internet port; a kitchen area; a bedroom with a second cable T.V. ; and a bathroom with a bath tub. Hotel facilities: Room service, airport shuttle, babysitting/child services, laundry, dry cleaning, internet services, currency exchange, shoe shine, car rental, tour desk, fax/photocopying, ticket service, Wi-Fi / wireless LAN.